Butterflies swarm a flowering plant at the National Butterfly Center, a 100-acre wildlife center and botanical garden in Hidalgo County, Texas. President Trump's planned border wall would cut the privately owned National Butterfly Center in two. A soldier butterfly (left) and a large orange sulphur are some of the 100 species of butterflies that can be found at the National Butterfly Center. The Department of Homeland Security argues in its recent waiver that the Rio Grande Valley section of the border, where the butterfly center is located, is an area of "high illegal entry." 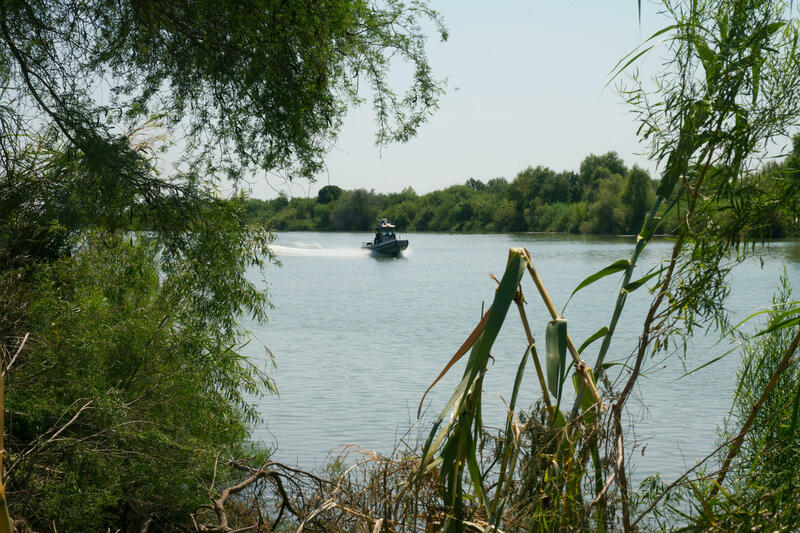 A U.S. Customs and Border Protection boat plies the waters of the Rio Grande near the edge of the National Butterfly Center. 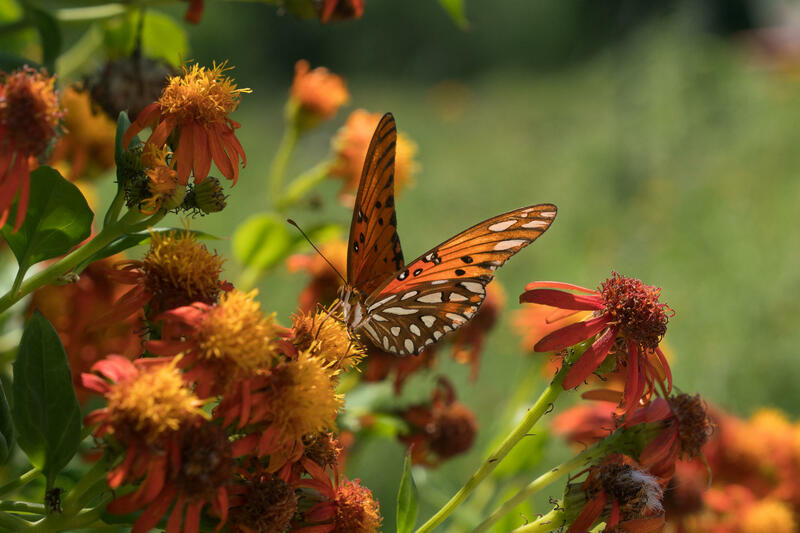 A Gulf fritillary butterfly perches on a flower at the National Butterfly Center, which is home to several endangered plants and threatened animals. 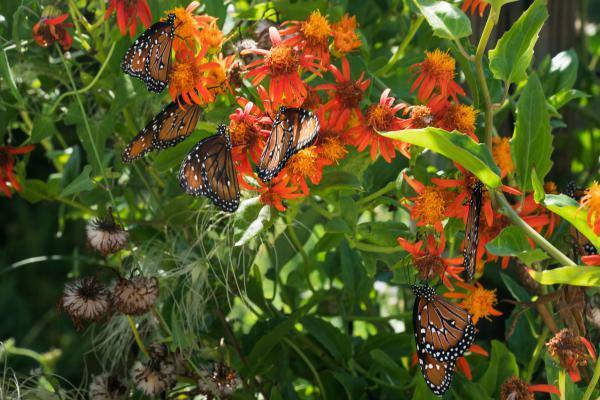 Queen butterflies flock to flowers on a flame vine at the National Butterfly Center in Hidalgo County, Texas. Marianna Trevino Wright, executive director of the National Butterfly Center, stands at the edge of the center's property where it meets the Rio Grande. Editor's note: This story was updated on Dec. 3. 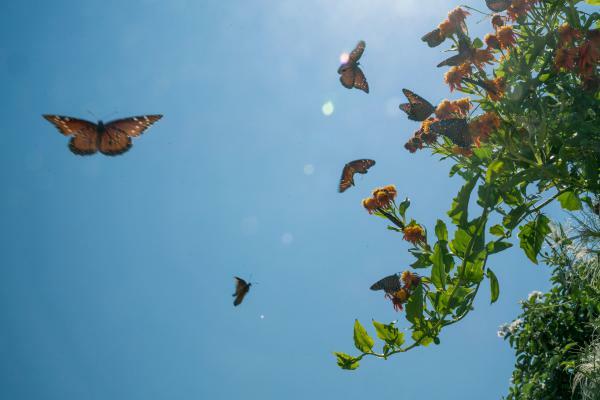 On an average day at the National Butterfly Center, a 100-acre wildlife center and botanical garden in South Texas, visitors can see 100 different species and as many as 200,000 individual butterflies. The center also sits directly in the path of the Trump administration's proposed border wall. "It's going to be a no man's land, Border Patrol's enforcement zone," says Marianna Trevino Wright, the National Butterfly Center's executive director. "They will clear everything. So it's not like all of this habitat is going to become Garden of Eden, undisturbed. It is going to be eliminated." The lower Rio Grande Valley, where the center is located, is home to 300 species of butterflies; this year, 237 species have been documented at the center, says Trevino Wright. 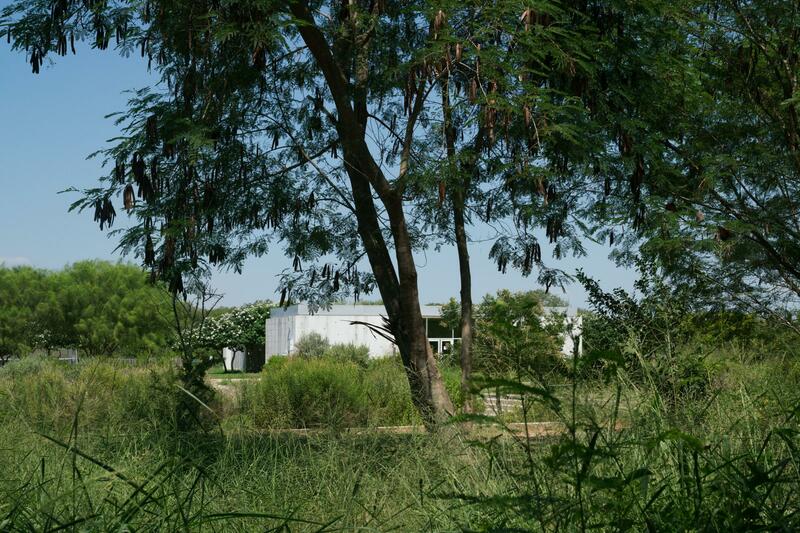 Opened in 2004, the center is also home to several endangered plants and threatened animals, such as the Texas tortoise and Texas horned lizard. In July, a group of scientists published a paper outlining the proposed wall's significant negative impacts on "some of the continent's most biologically diverse regions." The border wall would eliminate, degrade and fragment wildlife habitats — for instance, by clearing land, blocking access to water and food, and inhibiting seasonal migrations. More than 2,700 scientists signed on to the paper and called for the administration to rethink its border tactics. They've called for DHS to abide by the environmental laws that are already in place and forgo physical barriers when possible. 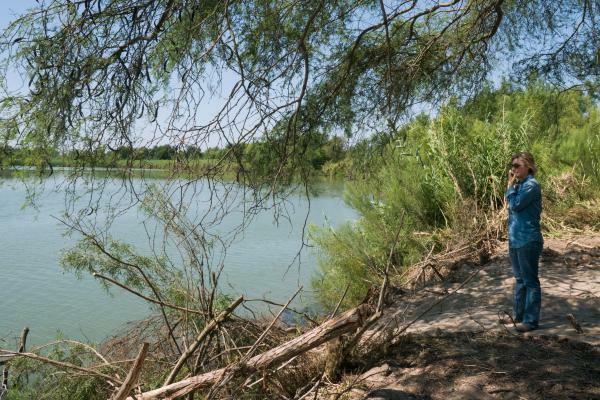 For its part, the DHS argues in its recent waiver that the Rio Grande Valley section of the border, where the butterfly center is located, is an area of "high illegal entry." Since 2013, this sector has seen the highest number of U.S. Border Patrol apprehensions of people crossing illegally or who are inadmissible. In fiscal 2018, which ended in August, 23,757 unaccompanied minors and 63,278 family units were apprehended in the Rio Grande Valley sector. The Center for Biological Diversity, Defenders of Wildlife and the Animal Legal Defense Fund are suing the Trump administration, arguing that DHS doesn't have the authority to waive these laws. Similar lawsuits have been unsuccessful, and the department has already waived environmental laws in New Mexico, California and now Texas to facilitate border wall construction. "Imagine coming home one day and finding people cutting down your trees, ripping up your fence and destroying your yard," says Trevino Wright. CBP did not respond to NPR's request for comment, citing the open litigation. Construction along the border is scheduled to begin in February 2019. 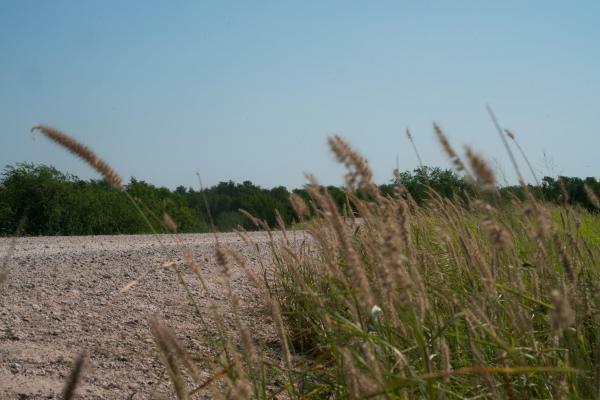 Until then, the butterfly center continues to use its property as though the barrier won't be built. "We have long-term plans for this place," says Trevino Wright. "We're not going to just pack up and abandon that." The radio story was reported and produced by Sam Gringlas and Christina Cala.